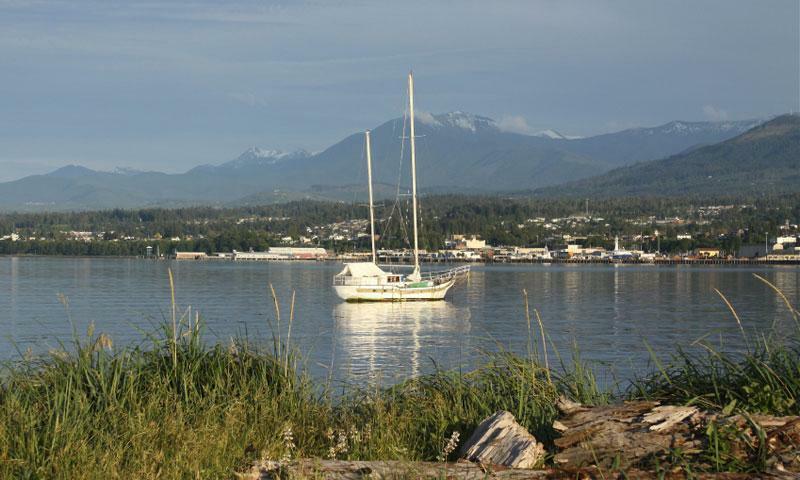 Port Angeles is a beautiful port town located on the serene Strait of Juan de Fuca. There are activities here for the most intrepid of sportsperson and also for those looking for a little rest and relaxation. Personalized bus tours for small group tours and excursions on the Olympic Peninsula. ART on the Town is an outdoor gallery showcasing sculptures. This unconventional gallery is available to all on the streets of downtown Port Angeles. A welcoming atmosphere, extensive wine list and authentic Italian cuisine keep locals and visitors coming back to Bella Italia. Take a wine and cheese tour through this lovely vineyard, sitting at the foothills of the Olympic Mts. Open all year except Jan, Feb and holidays. Forgot to pack your outdoor gear? Don't fret. Stop by Brown's Outdoor for all of your recreational needs. Not a typical Olympic Peninsula restaurant. Classic French cuisine in an elegant, sophisticated dining room and solarium. Soufflés, onion soup andfilets. A safe bet for breakfast, lunch and dinner in Port Angeles, WA. Fresh pastas, comfort food, tasty omelets and crisp salads. Located on the west side of Port Angeles, Camaraderie Cellars showcases their latest wines on weekends from May to October. An eclectic breakfast and lunch menu includes such tasty dishes as Belgian waffles and gourmet pizzas. Family atmosphere with outside seating. An extensive public transportation system throughout Clallam County, including Port Angeles, Sequim and Forks. A vineyard on a mission to great the most drinkable wine that also doubles as a brewery. Come to taste the wines; stay for a beer. Open year round. Lasting about 2 hours, a guided walking tour of Port Angeles is a great way to see the city. Reservations not needed; meet at the Chamber of Commerce. Great customer service and a wide variety of house and apartment rentals in and around Port Angeles. Furnished,/unfurnished, residential, commercial and more. Enjoy southwest cuisine at the Kokopelli Grill, then retreat downstairs to the Underground Night Club and dance the night away. Come over to Laurel Lanes Bowling Center, we are a great place to make bowling memories for your family, corporate event, or come bowl on a league with friends, old and new! A certified organic, family owned farm in Port Angeles, WA. Cultivating delicious fruits and veggies, Christmas trees and organic mulches and compost. There is something for everyone at Michael's, located in downtown Port Angeles. From fresh, local seafood and veggies to free range tenderloin. Top quality grapes sourced from reputable vineyards in E. WA and housed in an 121 yr old barn. You'll enjoy the atmosphere and the wine. Lace up your roller skates and hit the floor at this indoor roller and incline skate rink. This par 72, 18-hole golf course with wide open fairways is a great place to challenge yourself or just enjoy a relaxing round. Clubhouse and pro shop. Come see how the Mountain Men/Fur traders lived at our Annual Rendezvous each July. Shoot a black powder rifle, wander down traders row. Bring the yung uns!! Free! . A vitality and wellness center offering massage, classes and a delicious, healthy café with coffees and teas. Rite Bros. Aviation Inc. is a full service aviation company that offers charter services or scenic, sightseeing tours of the Olympic Peninsula. Community supported agriculture, fostering a connection between local farmers and customers. Catch the game on the big screen TV with a local microbrew or bring the whole family for a great meal. Fresh seafood, great views and friendly service. Strait Scuba offers a variety of diving services. Located in Port Angeles, WA, owner Howard Cunningham is happy to answer any and all scuba inquiries. Tour this beautiful lavender farm located on 10 acres of oceanfront property, overlooking the Strait of Juan de Fuca. A community pool providing swimming fun for people of all ages. Located at the Landing Mall in downtown Port Angeles, this wine bar is the perfect place to unwind. Live music and extensive wine and beer menu. Why should I visit Port Angeles? One of the largest towns on the Olympic Peninsula, Port Angeles features historic architecture, thoughtful art, and charming shops and restaurants. Port Angeles is a short ferry ride from the big city and is a short drive from Olympic National Park. Port Angeles, Wa is on the northern edge of the Olympic Peninsula, along the Strait of Juan de Fuca. Port Angeles lies on the Olympic Highway, WA 101. The town can also be reached by ferry. What sort of Services and Amenities does Port Angeles offer? Port Angeles, Washington is a large city featuring any services, goods, or amenities one might need. Many campers stop in Port Angeles for supplies before entering Olympic National Park. Lodging ranges from luxury hotels and motels to B&Bs and hostels. What can I do or see in Port Angeles? Port Angeles Fine Arts Center and Sculpture Garden: Featuring predominately Northwest artists, the works in the Port Angeles Fine Arts Center highlight the natural beauty of the Olympic Peninsula. This free art museum could be a great rainy day detour for those who like viewing nature in their art AND those who enjoy viewing art in their nature. Downtown Port Angeles: Exploring downtown Port Angeles can be an enjoyable way to spend a weekend away. Enjoy “just off the boat” seafood at one of the many local restaurants that have spectacular views overlooking the harbor. There are many unique shops featuring antiques, art, crafts, and trinkets, so you are bound to find that perfect gift to bring back from your Olympic Peninsula adventure. Kayaking: Kayaking is a great way to explore the craggy shores and bays near Port Angeles. Playful harbor seals have been known to follow kayakers for miles.